When I was in grad school I had a Biblical Studies instructor who was from Romania. He was a member of the Romanian Orthodox Church, but he seemed to have a great love of Judaism and was an active advocate against anti-Semitism. I remember him sadly telling us how he was sometimes uncomfortable when he went back to Europe to visit family because he claimed that anti-Semitism was once again on the rise. That was three years ago. Now it seems like I can’t go a day without reading about how anti-Semitism is on the rise not just in Europe but in the U.S. as well. And sadly we can see this attitude reflected in our own geek culture. Today I am going to specifically talk about the anti-Semitism in the X-Men/Marvel Movie Universe. First, let’s talk about the X-Men movies. Can you name all the Jewish characters in the X-Men movies? If you just answered Magneto, then you are very wrong. Magneto, Kitty Pryde, Quicksilver, and Scarlet Witch are all Jewish characters, but you wouldn’t know that if you had only watched the movies. Kitty’s Jewish heritage is extremely important to her in the comics, but there is no mention of her Jewish identity in any of the X-Men movies. The X-Men franchise takes erasing Jewish identity up a notch in the movie X-Men: Days of Future Past, which introduces us to Pietro and Wanda, aka Quicksilver and Scarlet Witch. Well, the movie introduced us to Quicksilver; Wanda was portrayed as a baby (despite the fact that the two are twins in the comics) and her name was never even mentioned. Quicksilver, meanwhile, was alluded to as being Jewish at least. After rescuing Magneto, Quicksilver mentions that his mom told him that his father could control metal: this is a nod to the fact that Magneto is actually Quicksilver’s father. But if you don’t already know that, then this moment goes by so quick (and is never mentioned again) that it hardly matters as a relevant part of Quicksilver’s character. Quicksilver’s name was also Westernized from Pietro to Peter in an attempt to erase not only Pietro’s Jewish identity but his Romani identity as well. So the only character in the X-Men franchise whose Jewish identity is ever specifically mentioned and explored is Magneto. In the first X-Men movie we see Magneto as a young boy being taken away to a concentration camp, and again we see Magneto hunting down and killing Nazis in X-Men: First Class. 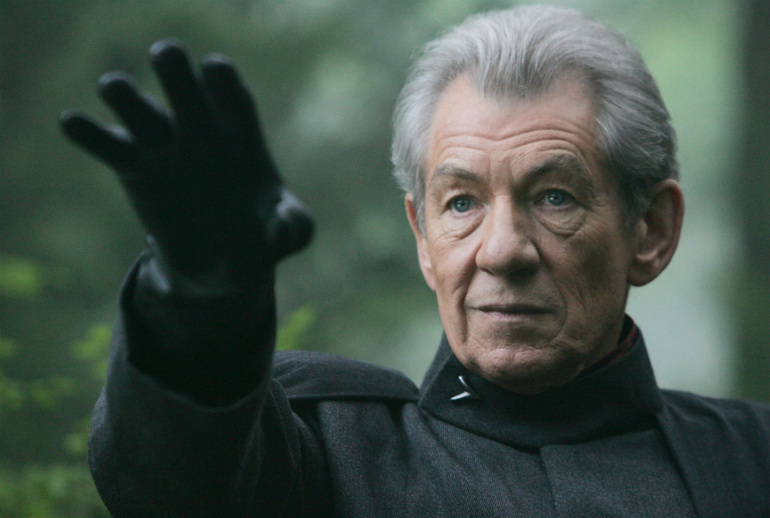 In other movies Magneto references his own experiences with prejudice as a Jewish man to justify his violent motives. While Magneto is an amazing, well-written, complex character, he is still portrayed as a villain who murders people for his own purposes and uses his background to justify it. Having another Jewish character to challenge Magneto on his beliefs would have been excellent storytelling. Instead what we get is the erasing of all other characters’ Jewish identities and the only character who is identified as Jewish is our murderous villain. Firstly, the two characters have a significant portion of their background removed from them, their Roma and Jewish heritage cast aside for two actors who are talented, but definitely of neither origin. So this begs the question: will their backstory be erased? So, basically, two Jewish/Romani characters who were persecuted for their heritage in the comic books will be volunteering to work with HYDRA… a Neo-Nazi organization. Is no one else raising eyebrows about this? I feel like eyebrows need to be raised. Yeah, you read that right. Pietro and Wanda volunteered to work for HYDRA. What the hell!? Oh no, it’s not HYDRA’s fault—Pietro and Wanda volunteered to help them! Again I say: What the hell!? This doesn’t just erase Pietro and Wanda’s Jewish/Romani identity, but also obliterates any of the oppression the two characters faced due to their identities. Which leads me to my next issue: HYDRA’s identity as a prejudiced Neo-Nazi organization is completely sanitized in the movies as if the producers are worried about offending the anti-Semitic viewers! It’s true that Red Skull wants to run things and does turn HYDRA into his own thing, but he is never not a Nazi, and HYDRA never abandons Nazi beliefs. If you watched the Captain America movies you would assume that HYDRA just wants to have totalitarian power and is in no way also interested in the extermination of whole groups of people. It’s as if the producers are worried about calling HYDRA Nazis, which is just so strange, especially since Nazis are a perfect villain since everyone hates them. You don’t as a writer have to explain why Nazis are evil, because everyone knows that they are. Did we learn nothing from Indiana Jones, guys!? Basically, the whole thing seems really questionable: erasing Jewish characters, portraying the only Jewish-identified character as a violent madman, and sanitizing a Nazi organization all point to a problem of anti-Semitism in the Marvel movies. With anti-Semitism on the rise, it is incredibly dangerous to erase and portray Jewish identity this way. The whole thing disgusts me enough to make me seriously question seeing Marvel movies. Furthermore, the whole thing is disrespectful to Marvel’s very creators. Stanley Martin Lieber, also known as Stan “the Man” Lee, is also a Romanian-born Jewish man. Many other comic book artists and writers were also Jewish. It’s disrespectful to our whole comic book history! This is something we need to talk about and make a big issue out of; we cannot allow Marvel to continue portraying Jewish characters so poorly. At least if we had well-written, well-portrayed, and well-researched Jewish characters in our (internationally popular) Marvel movies, we could help stem anti-Semitism in our pop culture. This entry was posted in Comics, Marvel Comics, movies, Oh My Pop Culture Religion, opinion, racism, Religion, X-Men and tagged anti-semitism, Jewish characters, Jewish representation, Judaism, oh my pop culture religion, racism, Religion, X-Men, X-Men Franchise by Lady Geek Girl. Bookmark the permalink. My friend and I are really pissed about this, and it’s led to some interesting discussions with people. The excuse I keep seeing people bring up is the whole movie rights thing, but as you mentioned, there has to be a way to mention their Jewish-Roma heritage without mentioning their parents (the fact that they retain “Maximoff” as their surname indicates that their foster parents aren’t forbidden). It’s really frustrating, particularly for my friend who is Jewish and doesn’t see herself get represented much these days. As for HYDRA, if MCU is trying to avoid the association with Nazis, they’re doing a poor job of it. Agents of SHIELD reminds us of the connection with Daniel Whitehall and all the flashback sequences it did to set up Agent Carter. I agree that there is no reason to erase their identity it’s absurd. I haven’t seen SHIELD or Agent Carter yet sadly so I have only had the movies to look at. So based on those I said it looks like Marvel is trying to avoid associating HYDRA with nazism. Maybe my opinion would change after watching those shows, but I would still find it suspicious that such connections would more emphasized in the tv shows, which reaches a smaller audience, than in the movies. What’s bugging me about this article is that it’s making it look like Romani and Jewish are related, that Romani is a branch of Judaism. It’s NOT. There are Jewish Romas, yes, there are also christian Romas and even pagan Romas. Romani are gypsy. Sadly, Romasi were also slaughtred by the Nazis not because some were Jewish but because of many other reasons. Also, sadly, they get little to no recolonization when it comes to things such as the holocaust. We are proud people and no, “my big fat gypsy wedding” that’s about an accurate depiction of Roma as Jersey Shore is to Italian Americas. I apologize if this article came off as if Romani and Jewish people are the same. I debated about whether to mention Pietro and Wanda’s Roma ancestry because this post is specifically about Jewish characters, but since their Roma ancestry was also being erased I felt it at least deserved to be mentioned. But yes Romani is in no way a branch of Judaism and is an ethnicity that is often erased, degraded, and looked down upon. I hope to eventually do a post about this very issue in our pop culture once I have done enough research. Thank you so much your comment! It might also be worth mentioning that Bobby Drake (Iceman) is half Jewish on his mother’s side (Irish Roman Catholic on his father’s) and it is an issue that is never addressed, even though we meet his family in the X-Men movies. In Earth-616, Nick Fury, and Heimdall are white, Xavier lost the use of his legs due to a mountain being dropped on him, Wolverine never had claws until they were installed by the government, and Jean Grey married Scott Summers. In Earth-1610 (Ultimate Universe), Wolverine has bone-claws, Nick Fury is black, and many, many other differences. Earth-199999 is the designation for the Cinematic Universe. In this universe we’ve already seen that Heimdall is black (a difference from the other two “main” comic book universes) as well as various other differences. The bottom line is, we can’t actually apply assumptions based on Earth-616 and Earth-1610 to the Earth-199999 universe. The early X-Men movies are designated Earth-10005 and differ from Earth-199999. In those films we see NO Bone Claws on Wolverine in any scans, x-rays, or back-story. Bone Claws appear in later films, likely influenced by the Earth-1610 series of books. In some universes, the Gods are Gods, entities beyond our understanding. In others they’re alien species, similar to, but different that ourselves. In some universes, Thor is the person who holds the hammer (anyone remember Beta-Ray Bill?). In others Thor is the name of an individual person regardless of where the hammer might be, or in whose possession. In some universes Storm is a sorceress, in some she was found in a small, tropical village having been worshipped as a Goddess her entire life, in others she was brought up in a fairly normal way until her powers manifested. Does Stark have instantly assembled Iron Man suits, or is suiting up a serious undertaking? I agree with the article that it makes no sense for Jewish characters to be working for a Neo-Nazi group and from the sound of it not delving into Quicksilver and Scarlet Witch’s Romani and Jewish heritage when they from the sound of it will be important characters in the movie. But I feel much of the article is over the top. 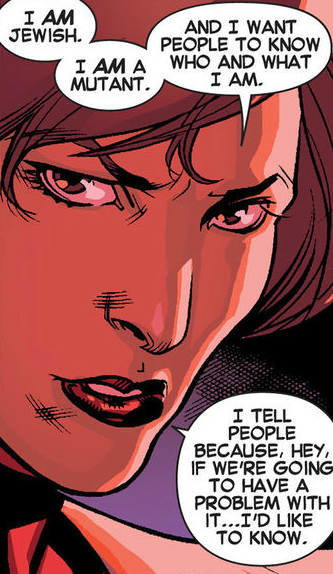 For example the fact that it isn’t mentioned that Kitty Pryde is Jewish. If they really delved into her character and didn’t mention it then that would be bad but they just didn’t delve into her character much at all. Many of the support characters in the X-Men movies have very little backstory given for them though so it’s not like it’s exclusionary. Really it’s a combination of poor story telling and it being a movie so they can’t give much background for the support characters since X-Men movies have so many support characters. Also the article asks us to list how many characters are Jewish in the X-Men movies and says all you can name is Magneto. Yes that is true but name how many characters do they specifically mention following any religion in the movies and other than Magneto? All I can come up with is maybe it was mentioned that Nightcrawler was Catholic even though many of the characters are very religious. Also I don’t think they called HYDRA neo-nazi’s because they made it quite plain that they were Neo-Nazi’s by showing it to the audience rather than telling them. I mean with the uniforms and the hailing and everything I got a very strong impression of oh they are Nazi’s, also they even show that HYDRA originally started within the Nazi organization in the first Captain America movie. Also Magneto is not portrayed as a bad guy he is portrayed as a complex individual who has a good reason for his hate and anger. Magneto is never portrayed as being just a villain in the movies, sometimes he is portrayed as a hero but more as a shade of gray. And if you asked who people’s favorite characters in the X-Men movies are they would probably say Magneto or Professor X, or Wolverine but there is something wrong with those people because Magneto and Professor X are the best. 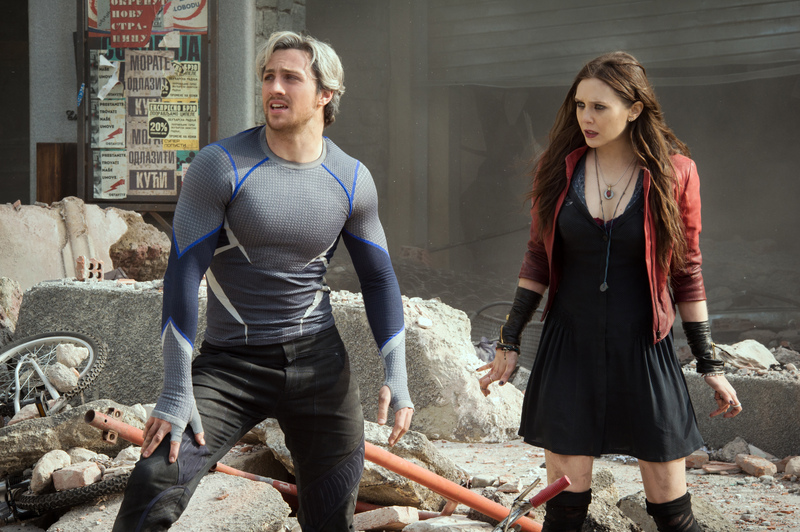 So overall I agree that it is terrible that Quicksilver and Scarlet Witch are working for Neo-Nazi’s. It makes me worried that the movie they will be in is going to be crappy and I find it offensive. But I dislike when people blow things out of proportion. The person who wrote this article has some good points but many of her points are saying it’s anti-semitic to not mention which characters are Jewish as part of their backstory but it ignores that the Marvel movies rarely give much of a backstory for support characters and that almost no characters in the movies mention their religion even though they are religious. But since they do go fairly in depth with the back stories of main characters, any main characters where Judaism is an important of their life and it isn’t mentioned or shown then yes that is anti-semitic and exclusionary. 1. Quicksilver and Scarlet Witch aren’t Jewish. 2. The X-Men films have been far from subtle in terms of showcasing Magento’s motivation (see: X-MEN: FIRST CLASS). 3. If you really want to get into it, Hydra is the Nazi’s science division. 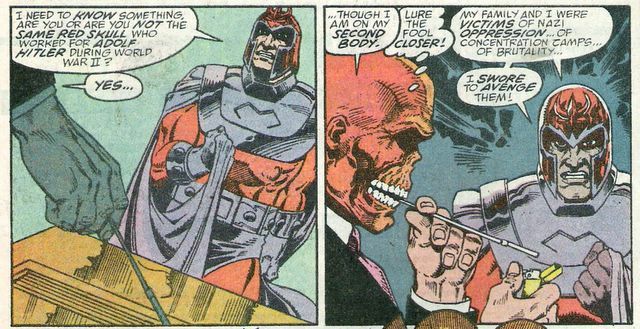 Red Skull even excplicitly states that he has no interest in Hitler’s “quests.” He even plans to kill him. 4. Kitty Pryde hasn’t been given enough character development in the film’s to be fully three-dimensional, let alone have her religion known. 5. Of all the character to mention, how could you NOT talk about Ben Grimm? Or his character not buzz worthy enough for you at the moment? In MCU, Pietro and Wanda can’t be Mutants, or Magneto’s kids, for legal reasons. So they ha’ve to acquire their powers. Based on what has been established that means either HYDRA, Inhumans, Asgard, or introducing a new source. Asgard makes no sense, and for some reason they don’t want them to be Inhumans. For some reason they are bad guys in this movie so HYDRA is the easy answer. No, no attention has been paid to minor characters’ religion or main characters’ heritage. But that’s about the usage of two hours of time rather than years of issues. Did we established Wolverine’s Canadian background in X-men? Colossus or Storm have accents? Kitty was portrayed by 2-3 actresses, like Jubilee. Jubilee can be instantly established as Asian, but it’s harder to establish a character as Jewish without going stereotypical. I’m disappointed to see that some of the comments here are attempting to justify erasure. Saying that inclusion is “too difficult”, implying that basic representation would hijack the movie, and that other characters don’t get all their (non-religious) backstories in dismisses the issue. They have so much in common with any other identity erasure rationalizations that it’s painful. Some of these comments seem to suggest that giving a nod to a religious identity will derail a story. It won’t. Nor would it take up a massive chunk of a movie or make it into an ‘issue’ film. I’m not even Jewish, and at the top of my head, I can think of some blatantly obvious things could establish characters as one faith or another “without going stereotypical” – and that would literally take less than 30 seconds. A Jewish person would be far better suited to coming up with short, faith establishing moments than I am. But, for the sake of argument, here are three: 1) wearing a necklace with a symbol of the Star of David. That one doesn’t even require dialogue, just a scene with the camera on their upper body. 2) Saying a quick prayer before jumping into – or even virtually in the middle of – life-and-death battle situations, which these characters inevitably will be in, could also work. 3) Having a single sentence in the entire script that references *any* meeting or conversation in their past with a “Last Hanukkah…” or other Jewish celebration. Agree with this overall, but it should be noted that Aaron Taylor-Johnson at least is Jewish. Actors of fully Jewish background: Logan Lerman, Natalie Portman, Joseph Gordon-Levitt, Mila Kunis, Bar Refaeli, James Wolk, Jennifer Jason Leigh, Julian Morris, Adam Brody, Esti Ginzburg, Kat Dennings, Gabriel Macht, Erin Heatherton, Odeya Rush, Anton Yelchin, Paul Rudd, Scott Mechlowicz, Lisa Kudrow, Lizzy Caplan, Emmanuelle Chriqui, Gal Gadot, Debra Messing, Robert Kazinsky, Melanie Laurent, Shiri Appleby, Justin Bartha, Sarah Michelle Gellar, Margarita Levieva, Elizabeth Berkley, Halston Sage, Seth Gabel, Corey Stoll, Mia Kirshner, Alden Ehrenreich, Eric Balfour, Jason Isaacs, Jon Bernthal, William Shatner, Leonard Nimoy. Andrew Garfield and Aaron Taylor-Johnson are Jewish, too (though I don’t know if both of their parents are). Actors with Jewish mothers and non-Jewish fathers: Jake Gyllenhaal, Dave Franco, James Franco, Scarlett Johansson, Daniel Day-Lewis, Daniel Radcliffe, Alison Brie, Eva Green, Joaquin Phoenix, River Phoenix, Emmy Rossum, Rashida Jones, Jennifer Connelly, Sofia Black D’Elia, Nora Arnezeder, Goldie Hawn, Ginnifer Goodwin, Amanda Peet, Eric Dane, Jeremy Jordan, Joel Kinnaman, Ben Barnes, Patricia Arquette, Kyra Sedgwick, Dave Annable, Ryan Potter. Actors with Jewish fathers and non-Jewish mothers, who themselves were either raised as Jews and/or identify as Jews: Ezra Miller, Gwyneth Paltrow, Alexa Davalos, Nat Wolff, Nicola Peltz, James Maslow, Josh Bowman, Winona Ryder, Michael Douglas, Ben Foster, Jamie Lee Curtis, Nikki Reed, Zac Efron, Jonathan Keltz, Paul Newman. Oh, and Ansel Elgort’s father is Jewish, though I don’t know how Ansel was raised. Robert Downey, Jr. and Sean Penn were also born to Jewish fathers and non-Jewish mothers. Armie Hammer and Chris Pine are part Jewish. Actors with one Jewish-born parent and one parent who converted to Judaism: Dianna Agron, Sara Paxton (whose father converted, not her mother), Alicia Silverstone, Jamie-Lynn Sigler. Just a factual note: Stan Lee was born in New York City, not Romania. The only thing that bothers me about this article is that it states that Quicksilver isn’t portrayed by someone of Jewish and/or Romani descent in Age of Ultron. It is well known that Aaron is of 100% Jewish descent and he is a proud Jew. Having that said, I think that this problem applies to most Marvel characters in the movies: they never really mention their background, ethnicity, religion etc. unless it’s a leading character. In MCU, including tv shows, as far as I know there has only been one character who has been explicitly stated to be jewish. And that is Edwin Jarvis’s wife in Agent Carter, who has one or two off screen lines and basically serves to add character development for Jarvis. For Marvel, which was started by Jewish guys, this is really annoying. They didn’t even mention or allude to the existence of Jews in the first Captain America movie, where they are literally fighting Nazis in WWII. They do allude to Howard Stark being Jewish in Agent Carter, but its not something you’d catch unless you were looking for it. Its really annoying. In First Class it’s heavily focused on Magneto’s background and motivation, several times there is focus on the numbers on his forearm, there is the memory of him and his mother which Charles digs from the depths of his mind that clearly shows that he and his family are Jewish, so to say that it’s antisemitic is a huge reach. In Days of Future Past, the little Maximoff girl is not Wanda, it’s another daughter of Mrs. Maximoff, and Wanda is never seen, only mentioned when Mrs. Maximoff says “go bug your sister”. They didn’t introduce Wanda because they only needed Quicksilver for the plot, and also because Disney owns the right for Pietro and Wanda, which is why Quicksilver was renamed to Peter in X-Men for copyright issues, not to be westernized. He has to be Peter Maximoff, because Pietro Maximoff is owned by Disney. And the thing about the other characters not being stated in the movies to be Jewish, it’s because it wasn’t relevant to the plot of the movies, especially when it comes to side characters. There is no time for them to be developed into full three-dimensional characters when they have only a few minutes of screen time and no actual story line going on. Besides Erik, hardly anybody else’s religion/background/etc. is on focus, because it’s not important for the plot of the movies they are in. And one more thing, Stan Lee was born in New York. You should ask the Jewish director Bryan Singer why he directed the films this way. Surprised you, nor anybody else in the comments mentioned this.